Pastry chefs, bakers and confectioners are looking back to the glory days of the ice cream parlor and the candy shop to get inspiration for their retro sweets—from cupcakes to doughnuts to homemade Cracker Jack. Produced by Kate Heddings. Researched by Kristin Donnelly and Emily Halpern. 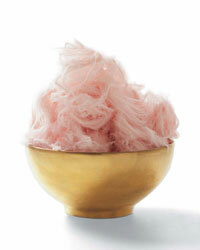 Not for the kids: Persian cotton candy, made from hand-spun sugar, sesame paste and flavorings like pistachio, rose and saffron, is rich, soft and delicate ($15 for 7 oz; pariya.com). At Sprinkles Cupcake in Beverly Hills, making cupcakes is an art. The creative varieties on offer include Ginger Lemon, Vanilla Milk Chocolate and Chai Latte (9635 Little Santa Monica Blvd. ; 310-274-8765). Doughnuts are making their way out of 7-Eleven and into retro-cool shops and restaurants. We're happy. This Los Angeles shop lets you customize your doughnut (15030 Ventura Blvd. ; 818-995-0140). The place in Portland, Oregon, for giant, wacky doughnuts (22 S.W. Third Ave.; 503-241-4704). Wednesday night is doughnut night at this sophisticated L.A. spot (7360 Beverly Blvd. ; 323-934-4400). Seattleites come for the cakey doughnuts and mellow coffee shop atmosphere (2124 Fifth Ave.; 206-728-1966). New bakeshops are making the cupcake an object of cult worship. This offshoot of Citizen Cake in San Francisco sells mini versions of cake classics (2 Stockton St.; 415-399-1565). Unadulterated, fluffy cupcakes with billowy buttercream rule at this Seattle shop. Plus customers get to choose their topping (2052 NW Market St.; 206-782-9557). This Manhattan shop makes traditional flavors like red velvet and pumpkin cream cheese (126 Rivington St.; 212-995-1960). This Minneapolis favorite sells more than 30 cupcake varieties (3338 University Ave. SE; 612-378-4818). Seasonal flavors like Medjool date and prickly pear seem thoroughly modern, but Ruthie Planas, 24, and Eric Shelton, 37, run their year-old Berkeley shop, Sketch Ice Cream, with a devotion to detail that calls to mind an old-fashioned mom-and-pop enterprise. The couple, who are now engaged, met in the pastry kitchen of San Francisco's Aqua restaurant. They bring a chef's respect for fresh ingredients to their ice creams, hitting the farmers' market three times a week to pick up exemplary produce and buying organic milk for the amazing gelati, luscious sorbets and refreshing granitas they churn out every morning. They serve scoops on crêpes, brioches, waffles and cookies they bake daily; on chillier days customers might prefer having their ice cream drowned affogato-style in hot chocolate, spiced cider or French-pressed coffee (1809A Fourth St.; 510-665-5650). Finding caramel-and-marshmallow Goo Goo Clusters no longer requires extraordinary effort. Beth Kimmerle and Will Noonan, the 36-year-old co-founders of Big Tips Candy, are packing this and 14 other candy bars in one box, the Big Tips Candy Collection. Every sweet is a hard-to-find classic, dating as far back as 1890 and still made in small batches. "There are all these great candy bars that people are obsessed with but can't find," says Noonan. He and Kimmerle are a little obsessed themselves: When they're not selling candy, they're hosting candy-making demonstrations called "Candymonium." The Candy Collection is $20 at bigtipscandy.com.